When I saw a picture and small description in the Destination Guide about Imesha, I thought it would be a nice change of scenery to visit! A futuristic city, with bright lights and dark alleys, high in the sky. Imesha is, according to the land information a place to hangout and explore. 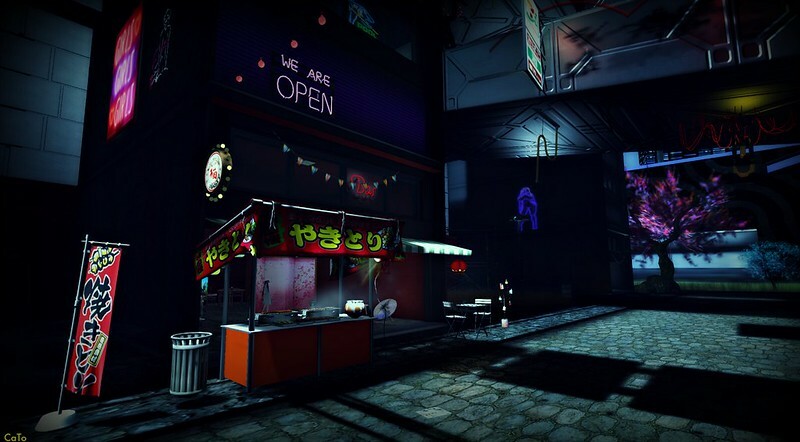 It is quiet a large city and somewhat dark to add to the atmosphere and although it is rated M, there is a bit of erotica around; such as a red light district – populated with mesh statues or NPC’s. There are some shops and clubs, but when I was walking around I was all alone and didn’t see any action. It is nice for pictures, specially when you are able to go to full graphics and see the use of materials and what I liked most were all the small details you will find if you take the time, very well done!